San Diego actually has a strong lineup for 2019. It has been a while, but the Padres have splashed the cash over the last two off-seasons. They went out and landed Manny Machado, giving them a premier player in the game, and consistent option at the plate. He will join Eric Hosmer, and Wil Myers at the top of the lineup. San Diego has been acquiring top prospects after being bad for so many years, and we will have to wait on Tatis at least for the moment, but Luis Urias is up and ready to take over. Austin Hedges will remain behind the dish, as will Franchy Cordero and Hunter Renfroe in the outfield. Both bats have a ton of power, but the contact rates are rather poor. The Padres are on the come up, and are a year or so away from being a contending team. Sooner or later the San Diego rotation is going to have to move up, because really there is nowhere to go anymore. 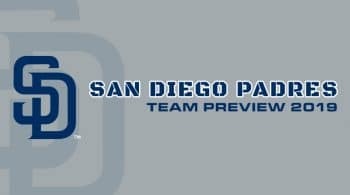 The Padres have a couple of names that stand to have some upside in 2019, but that is us looking at the positives. It is a somewhat new rotation, and you have to hope they are able to turn the corner a bit to try and see who they want for their future. San Diego won’t have any prospect pitchers coming up this season, that will likely be more in 2020. Joey Lucchesi is the name that draws our interest the most. He had 145 strikeouts in 130 innings last season, and has the most talent of the names in the rotation. While that may not be saying much, Lucchesi should have a long future with this team. He comes into the new season projected with a small innings increase, and a low four ERA. He should also be around a strikeout per inning. It gets tougher as the rotation gets on, but Robbie Erlin is getting some love with a few tweaks he made last season. His second half numbers are giving early projections a positive jump on him. Bryan Mitchell is the third starter, and this is where we really start to go downhill. He had over a five ERA last season, and is projected for the same with a 1.63 WHIP. Mitchell has below average stuff, and is a rotational filler until they can make a move. We have to remember the Padres are and have been in rebuild mode for sometime now, so cheap backend starters are just placement holder until something better comes. Eric Lauer and Luis Perdomo are two other names that will round out the rotation. Lauer is a weaker lefty who had a good stretch before crashing back down to earth. Perdomo is tough on right-handers with the good groundball stuff, but against left-handed hitters he really gave it up. If he can’t fix these issues, he won’t have much success in 2019. Overall this rotation finished 21st in ERA, so not all that bad for where they could have been, but they won’t be jumping into the top half of the league in pitching stats any time soon.